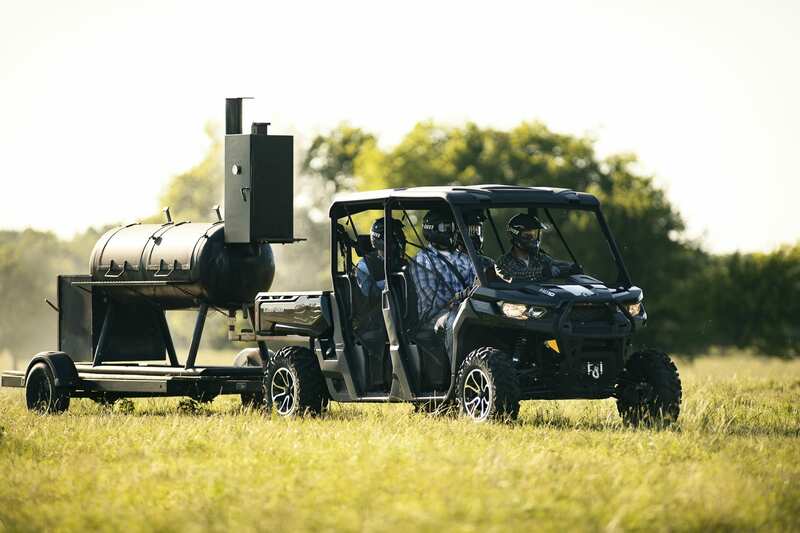 The Can-Am Defender MAX Lone Star HD10 side-by-side vehicle delivers a tough, capable and clever composition with specific package enhancements designed to complement the swagger and grit of the modern Texas rancher and outdoorsmen. 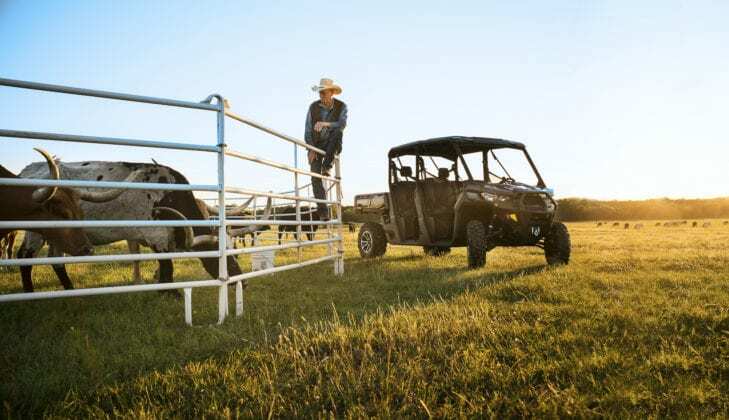 Whether it’s exploring the rugged backcountry or tackling agricultural chores, the Defender Lone Star edition, with its one-of-a-kind identity, is the perfect tool for tackling any task head on. 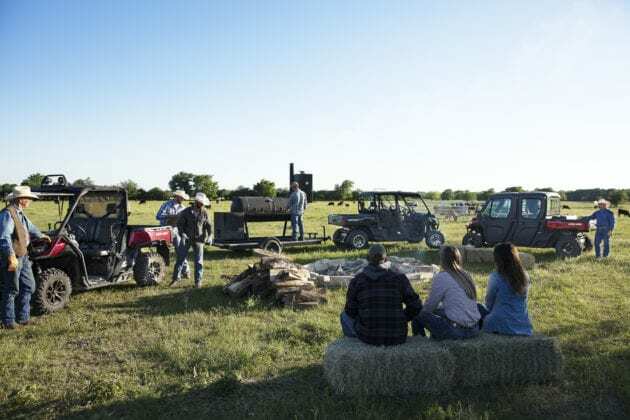 The Defender MAX family offers comfortable seating for up to six adults, unmatched versatility with its pick-up truck-inspired features and enhanced stability from its 115.5-in. (293.4 cm) long chassis. The appropriately dressed Lone Star HD10 package, complete with “Lone Star” badging, receives all the Can-Am Defender side-by-side vehicle family improvements for 2018. This includes new front and rear arched A-arms and a sway bar for enhanced ground clearance and improved handling in challenging terrain. New, larger 28-in. (71.1 cm) Maxxis Bighorn 2.0 tires on 14-in. (35.6 cm) aluminum wheels are as functionally adept and durable, for the varying Texas terrain, as they are attractive. 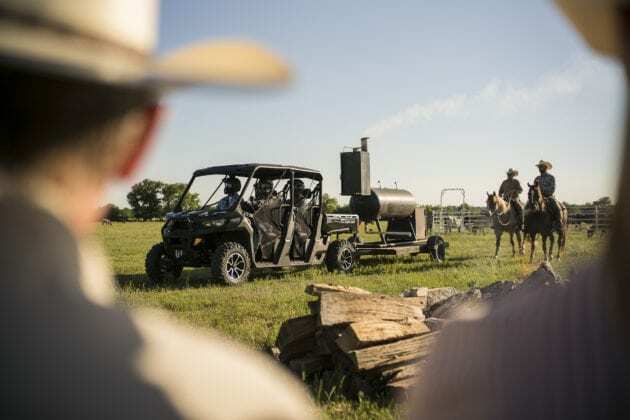 The Lone Star HD10 vehicle includes a full hard roof, heavy-duty front steel bumper, custom seat trim, and a painted Deep Metallic Black finish, giving it the proper look of a long, tall Texan. 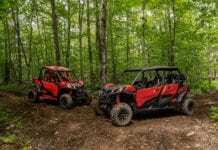 All Can-Am Defender MAX side-by-side vehicles feature the proven heavy-duty Rotax engines, PRO-TORQ Transmission, high precision, rigid chassis, TTA-HD rear suspension and easy serviceability. 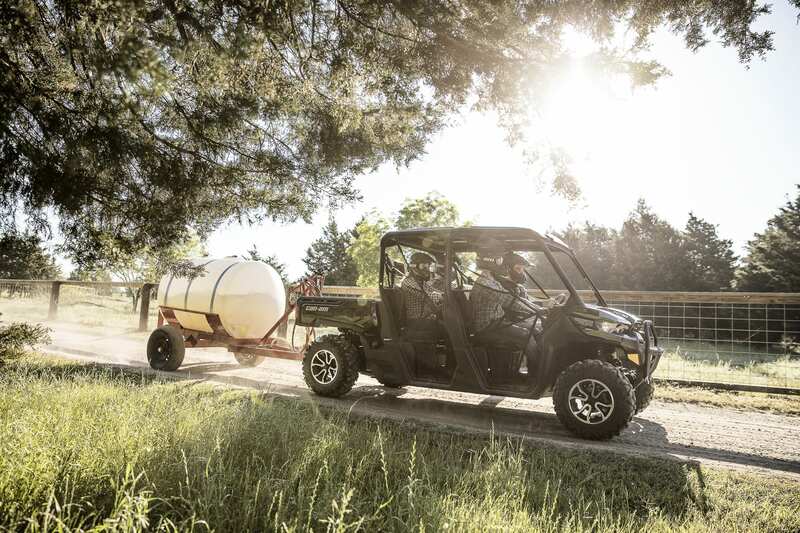 Designed to be reliable and easy to service, the Can-Am Defender side-by-side vehicle has no break-in requirements and is maintenance free for the first year (1,865 miles / 3,000 km or 200 hours). 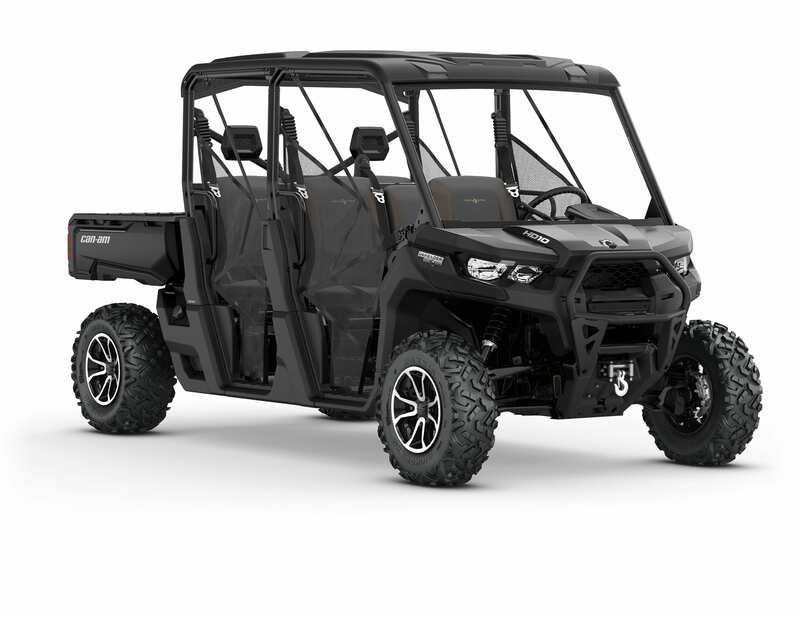 When it comes to a dependable, rugged modern-day utility workhorse, nothing compares to the 2017 Can-Am Defender MAX side-by-side vehicle; engineered to be tough, capable and clever. The Defender MAX DPS side-by-side vehicle’s 72hp Rotax HD10 V-Twin is specifically tuned for serious work but also offers 61 lb.-ft. torque and peak torque at lower RPM for optimal delivery during recreational use. 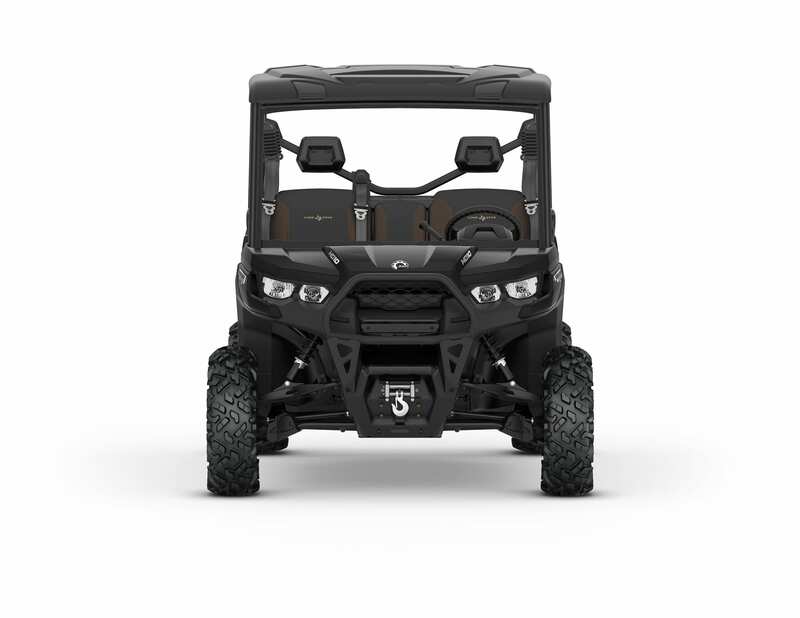 The PRO-TORQ Transmission is specifically calibrated to meet the utilitarian demands of the Defender MAX side-by-side vehicle. The transmission features a Quick Response System (QRS) that enhances low-speed riding, delivers smoother and more responsive power delivery and offers precise engagement. Larger CVT ratios with a work-specific low gear ensure optimal torque delivery for heavy loads. At low speeds, optimized ventilation improves belt durability and ensures more efficient power transfer. The Electronic Drive Belt Protection monitors the CVT belt to determine its condition and alerting the driver when necessary. This device offers belt-spotting protection to alert the driver if he or she is in high gear, but should be in low gear. The vehicle will not move and a “LOW GEAR” message will appear on the gauge, alerting the driver. The Defender MAX side-by-side vehicles also come standard with Park, Reverse, Neutral, High and extra Low. The system offers smooth shifting, along with integrated hill descent control for smooth, predictable deceleration. A helical gear transmission provides a quiet environment for the operator. The rear, maintenance-free differential gear-on-gear components are efficient, responsive and also built to last. 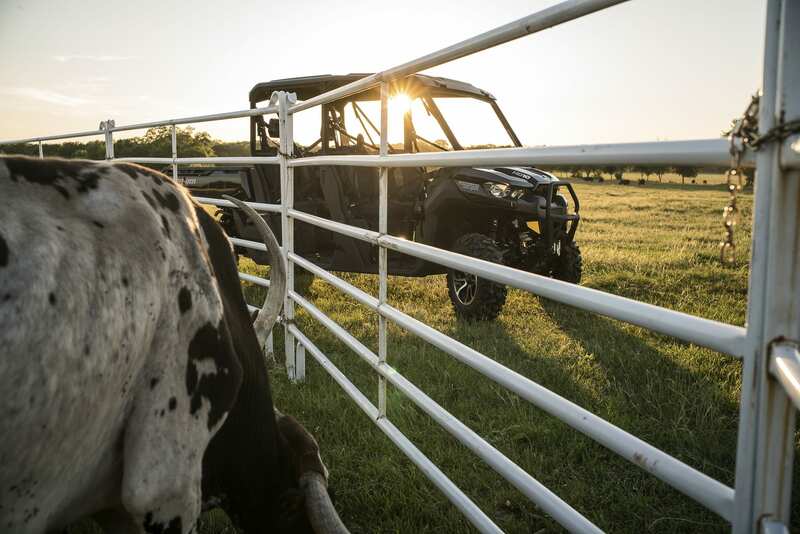 With zero break-in maintenance required and an annual maintenance schedule, Defender MAX side-by-side vehicles reduce total maintenance costs for owners. The yearly advised maintenance intervals are 1,865 miles (3,000 km) or 200 hours. 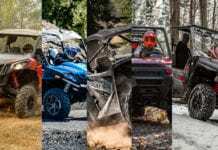 Can-Am engineers, gathering insights and feedback from owners, created a convenient platform for service, improving access to components with a special focus on do-it-yourself and ease of maintenance. A Service Center is located beneath the front hood with easy access to brake fluid, toolkit, fuse box and diagnostic connector. The rear-end also features easily-reachable maintenance elements such as engine bay, oil dipstick, air filter, CVT, transmission and coolant. Other critical parts such as the battery, bushings, drainage /cleaning holes and light bulbs have been also strategically positioned for a quick-access. The Defender MAX side-by-side vehicle is an extremely capable off-road vehicle and a legitimate workhorse that uses a 32.5-in. (82.5 cm) longer chassis with automotive-like technology and fabrication tolerances that are in line with modern pick-up trucks. The high-strength, low-alloy (HSLA) grade steel means a more rigid frame to withstand even the toughest chores. The Defender MAX side-by-side has a powerful 650W magneto capable of handling high-powered lighting and other electrical accessories. The high-strength full skid plate (center and sides) is designed for supreme protection and provides the ability to slide over sharp-edged obstacles. A durable, powder-coated black steel front heavy-duty bumper enhances the Lone Star HD10 edition’s front fascia while also supplying added protection for ranch work. 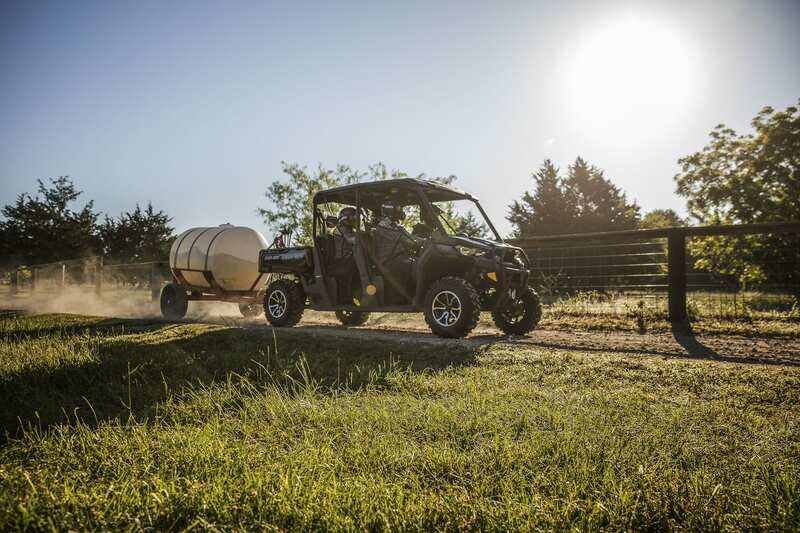 The Defender MAX side-by-side vehicle offers a 4-mode traction system with choices for varying terrain and tasks. 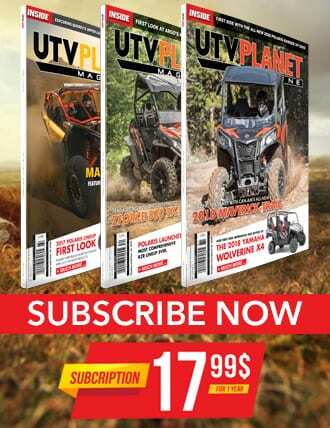 Users, via separate front-and-rear toggle switches, can select between a 2×4 open rear differential for tight turning and turf protection, a 2×4 lockable rear for improved 2WD traction, a 4×4 open rear for more maneuverability in rugged terrain and a 4×4 locked rear for maximum traction. Regardless of mode, the Defender MAX side-by-side vehicle is designed to offer a tight turning radius for improved maneuvering in tight, technical terrain. The rear differential is gear-on-gear to the transmission for better response, no maintenance, better efficiency and fewer components. 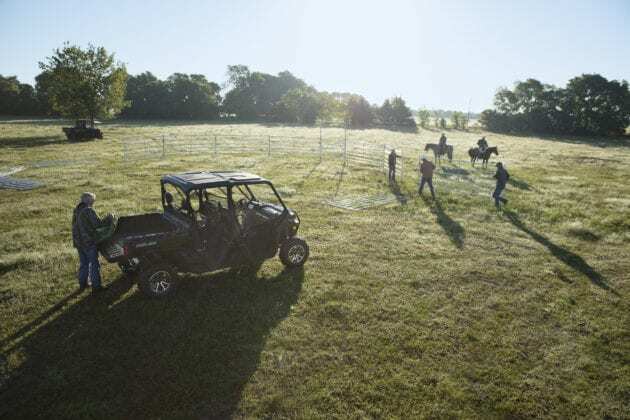 Defender MAX vehicles are engineered to offer versatile performance in varying terrain with control, whether it’s for serious work or recreational enjoyment. 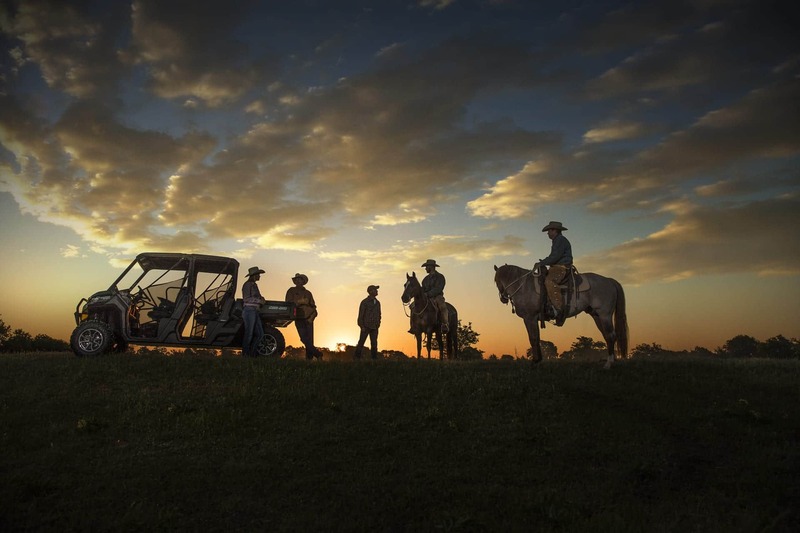 The Defender MAX family is outfitted with a dependable and plush suspension, tight turning radius for unmatched terrain capabilities and maneuverability to supply drivers the confidence to go practically anywhere. 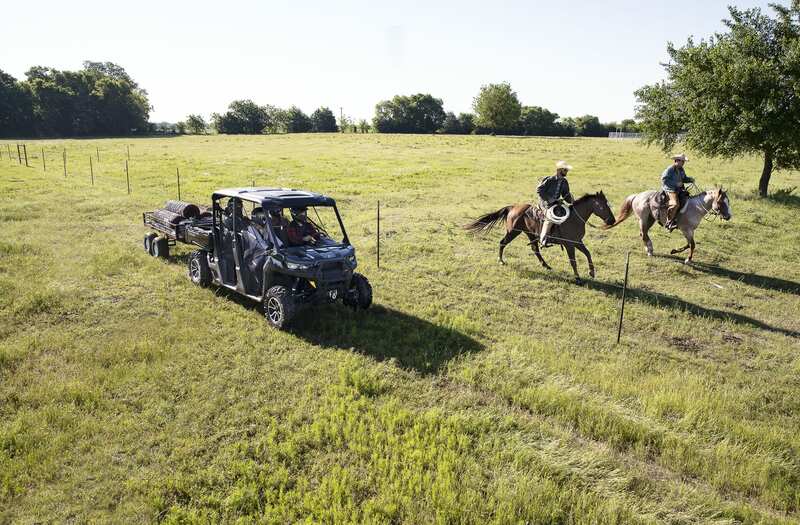 The Defender MAX lineup also features industry-leading, hauling and payload capacities. The Defender MAX side-by-side vehicle is designed to offer a tight turning radius for improved maneuvering in tight, technical terrain. The rear differential is gear-on-gear to the transmission for better response, no maintenance, better efficiency and fewer components. 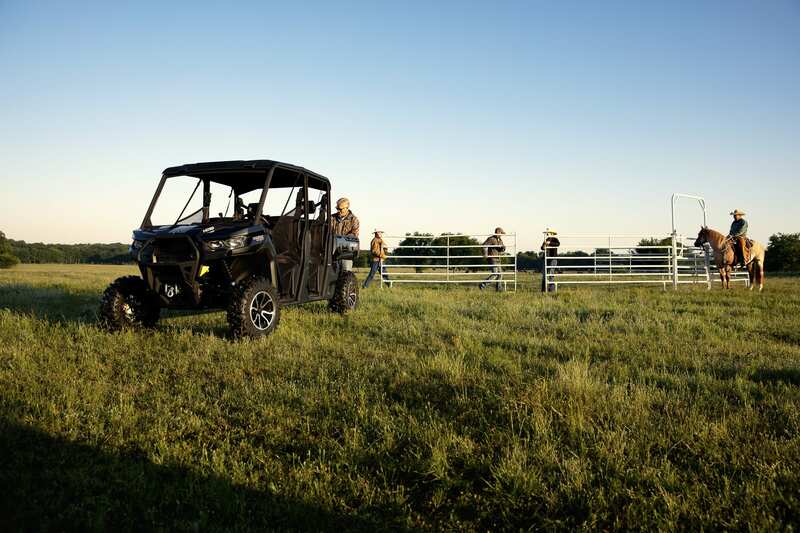 The Defender MAX Lone Star HD10 vehicle has an arched front double A-Arm suspension system designed to offer a wider stance for improved predictable handling and control even in difficult terrain. With 10-in. of travel, the ride is smooth in all situations, even when carrying heavy loads. The Defender MAX Lone Star HD10 vehicle uses arched, heavy-duty Torsional Trailing A-arms (TTA-HD) designed specifically for utility and recreational usage, offering a full 10-in. (25.4 cm) of travel to provide a smooth ride whatever the terrain. Its architecture offers optimal comfort and drivability in all conditions, thanks to no camber. 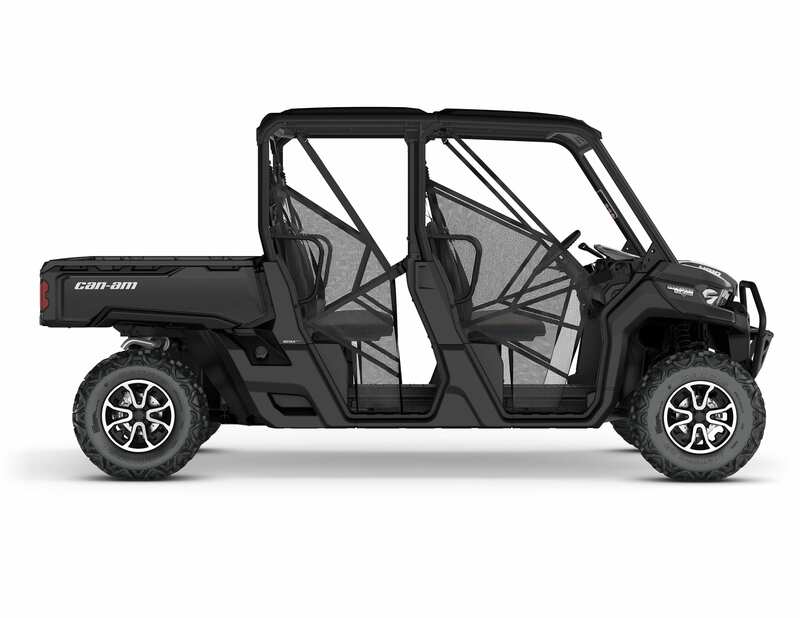 Defender MAX side-by-side vehicles offer 13-in. (33 cm) of ground clearance for maximum performance for conquering difficult terrain or carrying a maximum load. Larger 28-in. 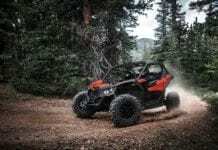 Maxxis Bighorn 2.0 tires feature rugged six-ply radial construction, yet are lightweight to cut down on unsprung weight. The non-directional tires are very capable of climbing and clawing across tough terrain and also absorb varying surfaces for a smooth ride and provide predictable cornering. Sturdy, lightweight, 14-in. cast-aluminum wheels with a unique painted black aluminum machined finish come standard. The Defender MAX side-by-side vehicle uses front and rear twin piston calipers with two 220 mm discs for superior stopping force, even when pulling heavy loads. For a superb wide-visibility, two 35-W reflectors on each side run at 140-W on high beam to provide superb candlepower for early morning scouting trips, trail rides or late night farm chores. Taillights are LED for enhanced visibility in all conditions and confer a new level of refinement. Standard on all DPS-equipped vehicles, the refined second-generation DPS system is tuned for utility applications while also offering responsiveness for recreational usage. DPS improves steering feel in slow-speed working situations and in more technical terrain. It also is designed to offer less assistance at high speed and more assistance at low speed. Defender MAX side-by-side vehicles have a tight 17.3-ft. (527 cm) turning radius for easy maneuverability in restricted work environments, hauling heavy loads and for recreational use. When turning a full circle, the vehicle has a 2-ft. (60.9 cm) shorter diameter than the segment’s top-selling competitor. Handling serious chores is simpler thanks to the Defender MAX side-by-side vehicle’s strong Rotax V-Twin engines and exceptional towing, hauling and payload capacities. The Defender MAX side-by-side is rated to tow up to 2,000-lb. (907.2 kg), haul up to 1,000-lb. / 454 kg in its large cargo box and has a 1,750-lb. (793.8 kg) payload capacity. 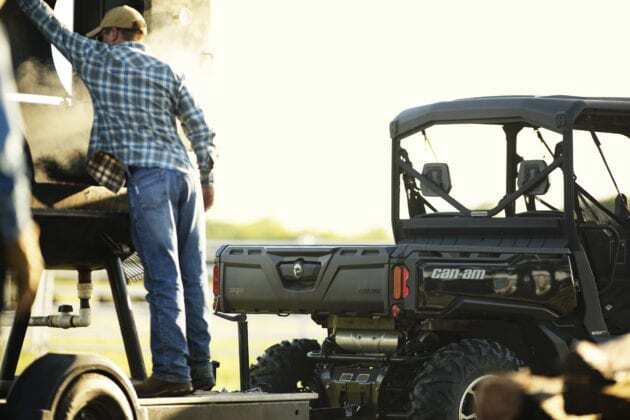 All Can-Am Defender models feature a 2-inch (5.1 cm) hitch receiver. Its standard size means a hitch can be transferred directly from a work truck. Combined with an industry-leading 10.6-Gal. (40 L) fuel tank and excellent fuel efficiency, the Defender MAX side-by-side vehicles provide maximum range for both serious work and recreation. 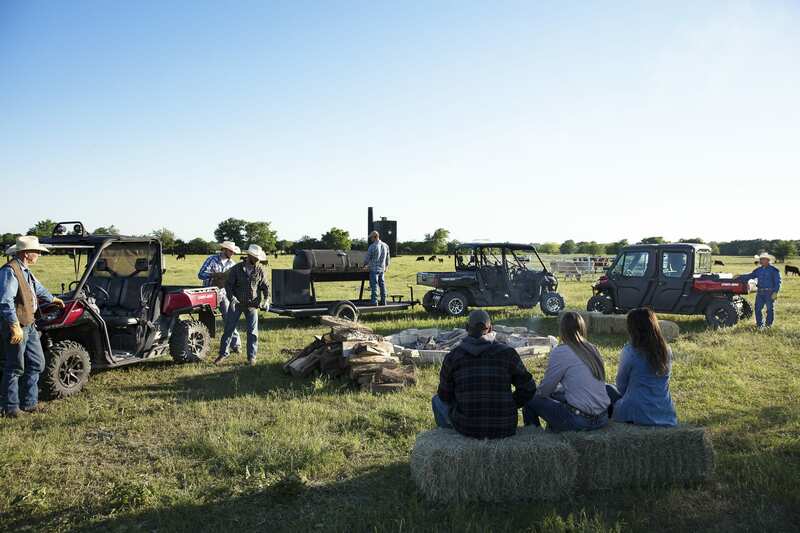 The Defender MAX family of utility side-by-side vehicles offers clever and meaningful solutions, enhancing ease of use and helping owners work smarter. 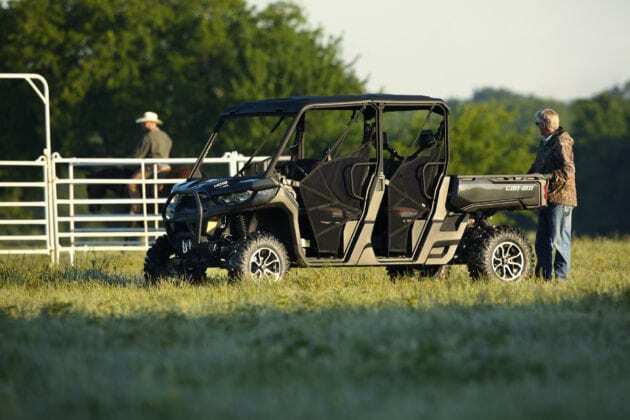 Can-Am engineers and designers crafted the Can-Am Defender MAX side-by-side vehicle ergonomics to accommodate a wide range of users while at the same time providing comfort, convenience and an unmatched fit-and-finish. 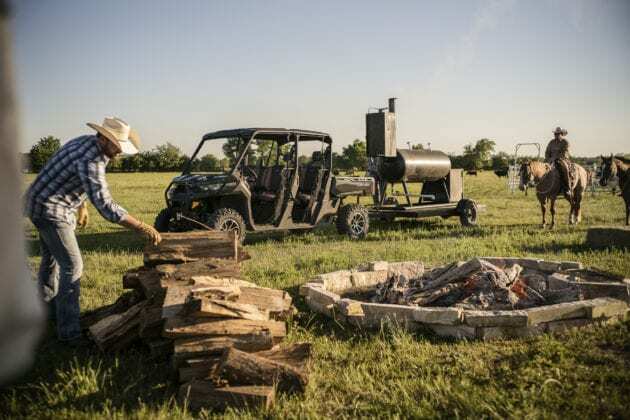 Owners can make the vehicle their own by fully utilizing the cargo box’s versatility and taking full advantage of the adaptable storage areas. The highly durable Cargo box has a 1,000-lb. (454 kg) load capacity and simple dumping capability. Clever features include 5-Gal. (18.9 L) pail recesses, integrated anchors on the sidewalls and several tie-down points for added convenience. To fully optimize the sizeable cargo box, consumers can divide the box using the integrated recesses. The box allows for both 1×3 and plywood separators and accepts bed extenders for refining the bed’s overall dimensions. The cargo box is also adaptable to accept 14 LinQ quick-attach accessories for further customization. Additionally, the sturdy tailgate can withstand ordinary farm use and serve as a seat during your lunch break (max weight: 250-lbs. / 113 kg). It can also be removed in seconds without tools. The open dash design features a handy removable and water-resistant 1.7-Gal. (6.3 L) toolbox, an industry exclusive, to allow users to carefully carry tools and supplies they need in an organized manner. In addition, it includes 6-Gal. (22.8 L) of under dash storage with an enclosed pocket, perfect for stowing small essentials. Combined with the removable and waterproof under seat storage box, the Defender MAX XT side-by-side vehicle features a total of 16.9-Gal. (63.9 L) of storage solutions. items, and is easily removable for the user’s convenience. 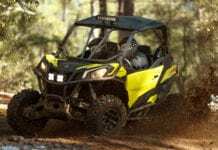 The driver can select between three different driving modes on the Can-Am Defender MAX side-by-side vehicle to adapt to personal preference and the riding conditions: Eco, Normal and Work. 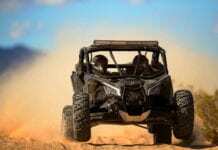 Normal mode has no speed or torque limitations and is optimized for recreational use with no load or a light workload. Work mode is calibrated for working with high loads in a smooth manner, offering a smooth power delivery along with full power and torque. ECO mode limits both high-range speed and torque to produce moderate driving with regulated-but-smooth acceleration. Specialty, dual VERSA-PRO bench seats, engineered as a 40/20/40 bench seat, are found on the Lone Star HD10 package. 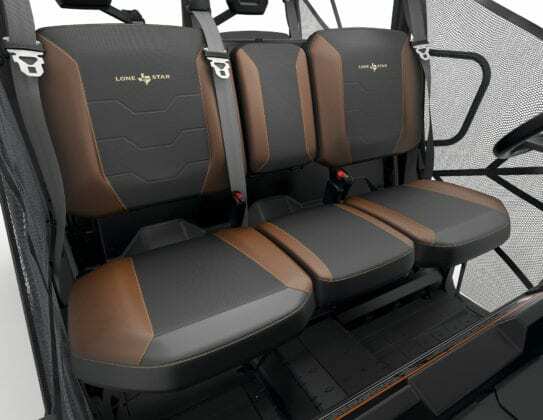 Inspired by modern pick-up trucks, the Defender MAX side-by-side vehicle can comfortably accommodate up to six adults and features profiled corners to improve entry/exit of the cab, as well as a sturdy black / tan vinyl cover with embroidered “Lone Star” logos, for improved wear resistance and customized look. The five passenger seats have integrated hooks on their underside and can be flipped up to improve onboard storage. Can-Am designers also added front and rear foldable armrests with cup holders for additional convenience. In addition, the VERSA-PRO bench seat comes with a 3-in. (8 cm) adjustable driver’s seat (forward/rearward) for added comfort and better ingress/egress. 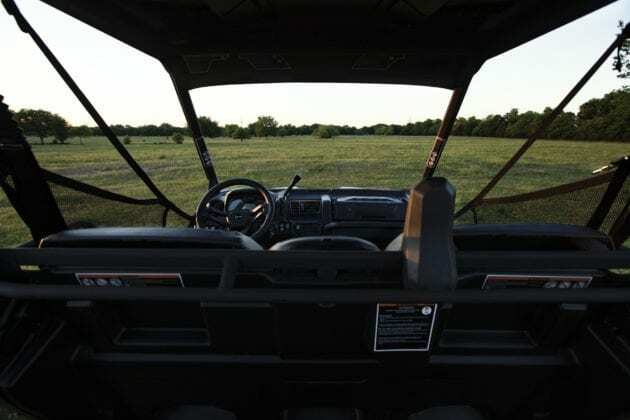 The Defender MAX side-by-side vehicle offers a spacious cockpit with unmatched fit-andfinish. Engineers optimized the interior ergonomics for a wide range of uses. Tilt steering, improved sightlines, enhanced storage and overall cockpit volume improve comfort and convenience. The A-pillar was moved far forward to provide almost effortless entry/exit and to enhance visibility for all the occupants. More interior cabin and dash space, rather than overall exterior hood size, creates a more spacious interior. The steering wheel was specifically designed for utility applications with a larger diameter for improved handling and control. The automotive-like tilt steering lets drivers adjust it up to 25 degrees to their preferred driving style and ergonomics. It offers also an easier maneuvering while entering/exiting the vehicle. The multifunction analog/digital gauge package includes state-of-the-art instrumentation as well as an additional enclosed and water-resistant 0.9-Gal. (3.4 L) storage section to protect smaller items. This includes an analog tachometer and speedometer combined with an advanced digital information center. 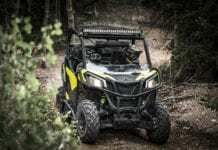 The new Can-Am Defender MAX side-by-side vehicle has six easily accessible cup holders. Four cup recesses are also incorporated into the cargo box tailgate for added convenience. The ergonomically placed grab bar and footrests allow for optimal occupant stability and comfort. The sturdy Profile cage (steel) is designed in tandem with the Can-Am cab and genuine accessories to ensure the best fit-and-finish and seamless integration in the industry. The front section of the cage was moved far forward to enhance visibility and improve entry/ exit of the cab. A durable, heavy-duty plastic roof protects all occupants from elements while giving the Defender MAX XT units a custom appearance. The winch is designed to handle heavy-duty loads at the worksite and on the trail, thanks to its 4,500-lb. capacity and roller fairlead. A convenient button was also added to the console on the left side of the steering wheel for easy operation. To complete the Texas-inspired Lone Star HD 10 edition Defender, the unit features custom trim, seat stitching and badging. This includes the words “Lone Star” and the shape of the state of Texas with appropriate coloration. The Defender MAX Lone Star HD10 comes in the attractive, painted Deep Metallic Black finish.